This lovely, spacious studio apartment is directly on the piste, in the beautiful snowy( in the winter) & Sunny (in the summer) village of Belle Plange. The village is a hive of activity with everything you need at your door step, including lovely restaurants and bars, the local super market and bakery, ski hire shops and ski schools, Bowling Alley and near by an ice rink and outdoor heated pool with spa. In the summer months Belle Plagne becomes a fantasic place for exploring the mountains, climbing (Via ferratta with zip wires), walking, mountain biking (electric mountain biking for those who are not so fit is brilliant fun). There is a go ape type attraction and public swimming pool at the bottom of the gondolla with stunning views of the mountains and jacuzzi and sauna. There are bouncy castles and trampolines, a park and plenty of animations for the children going on throughout the summer. The apartment is divisible by a full length, sliding wooden partition allowing you to separate the room with a single bed and a set of bunk beds from the lounge where there are two single sofa beds. As studio apartments go it is spacious and comfortably sleeps 5 along with all the facilities needed to cater for five people. This apartment is perfect for families or groups of friends and ticks all the boxes when looking for the ideal ski apartment, it's location is second to none and it is extremely comfortable. It also has a gorgeous sunny balcony. Direct access to the Bellecote Glacier via bubble car and one run down to some of the major chair lifts in La Plagne. Some nice easy blue runs home too! This apartment is perfect for groups of any kind and is very versatile. It is definitely larger than the majority of studio apartments available and fantastic value for money especially in its great location. what ever you need is literally just out side your door. There is one bathroom with bath and integrated shower and hand basin and a separate toilet. Public Parking - under cover beneath the building and in the outside area at the entrance to Belle Plagne and is charged per hour/day/week. Great property for 3 people to stay in, right on the slopes in the heart of Belle Plagne, short walk (across the slope) to a supermarket, bakery, bars and restaurants. Property itself is an unconventional layout (from my experience) but all the better for it, it allows a sliding door to separate the lounge, bathroom, hallway from the sleeping, dining kitchen area and allows kids to go to bed earlier. 2 additional people could sleep on the sofas but it's perfect for 3! Kitchen is really modern and well equipped, that and the proximity to the slopes/shops meant I hardly ever ate out. Only improvements would be an extension cable for the TV/DVD player which I believe needs to be moved a little to plug it in (I didn't use it though). Also be aware that parking is limited in the village and if you need to park you're tied into an additional 10 Euros a night. Perfect location in a fab resort! 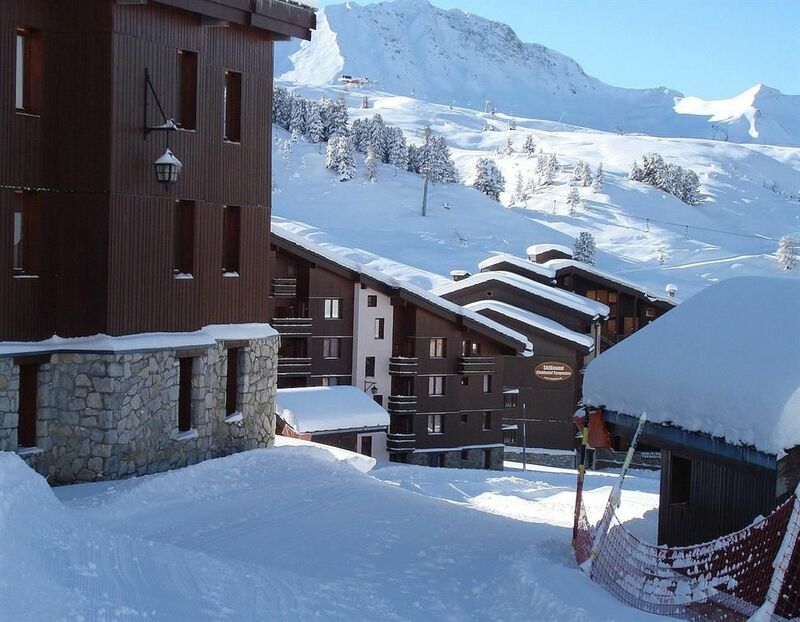 This 4/5 person apartment is perfect ski-in/ski-out in the heart of Belle Plagne. Only a 5 minute walk to the shops/bars/restaurants and the south facing balcony is wonderful to enjoy the lunchtime sun on. Brand new kitchen and bathroom were lovely and whole apartment is very cosy. This property is ideally located in the village, ski in/out on one side of the building, amazing views and sunshine on the other. The apartment is clean and well maintained. With a new kitchen and bathroom, this apartment makes a wonderful base for winter or summer activities. The balcony makes a wonderful spot for a bit of relaxation and soaking up the sun, after a hard morning on the slopes. Shops are restaurants and ski hire are really close by. All in all a great place to stay with an amazing location. .Nous sommes heureux que vous aimez l'appartement. Il n'est pas possible de réserver une place de parking malheureusement. Le four dans la cuisine est en fait un micro-ondes ainsi que c'est un four à combinaison. La télévision n'a jamais été mentionné auparavant car nous ne l'annonçons pas avec une télévision et on peut clairement voir tous ses facitlites sur ce site avant de réserver.